In July, I read a book that changed my life. 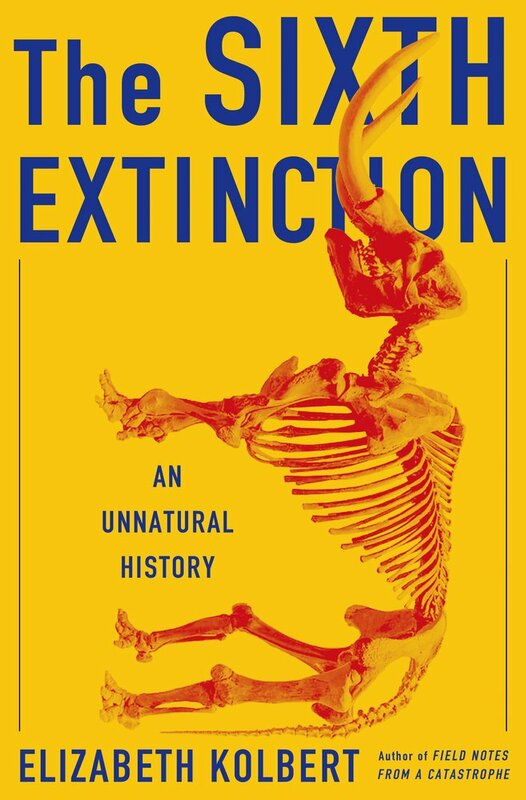 The Sixth Extinction: An Unnatural History, by Elizabeth Kolbert. Published in 2014. This book was one of The 10 Best Books of 2014 as listed by The New York Times, which is how I discovered the book. I’ve been doing research on ocean acidification for my current work in progress, a Young Adult fantasy novel, and I knew right away that reading this book would be helpful. This is a nonfiction book about climate change, ocean acidification, and the human-caused mass extinction event currently taking place. The book is extremely well-written, full of accessible scientific information and facts. And it’s one of the most gripping, horrifying, deeply moving, and powerful books I’ve ever read in my life. The book has sent me into the horrors our planet is facing due to global warming — and things are very grim indeed. Jon Stewart interviewed Elizabeth Kolbert about her book on The Daily Show in February 2014. Of course, that interview makes me smile, but it is gallows humor, and I certainly have tears to go along with my smile. In fact, I bawled like a blubber-walla through much of this book. Just thinking about how much crying I’ve done in the past four weeks while reading The Sixth Extinction inspires more tears. Some sections, I read aloud to Greg while we were driving to Utah, and while we were camping. But I would choke up so bad and start crying, that I couldn’t continue. This is not a book I could ever read aloud without stopping to cry. Greg is worried about me. He thinks it’s dangerous to dwell on what’s happening to the planet because we’re not taking drastic, global action on climate change. He’s worried about my psychological health. I’m just worried about the planet. The planet, humanity, and all of the lifeforms going extinct, as we carry on with business as usual. The World Is Blue: How Our Fate and the Ocean’s Are One, by Dr. Sylvia A. Earle. Published in 2009. This book covers similar territory as The Sixth Extinction — but there is no overlap of information. Each book is completely distinct, and reading them together deepened my understanding of climate change issues considerably. I feel like I’ve been rocketed off “planet blindness” in more ways than one, and I now live on “planet in massive trouble with a dwindling window of hope.” There is no going back. Awareness. Awareness and a sense of urgency. For example, I drive a 2010 Prius hybrid, and I’ve spent hours and hours these past few weeks trying to figure out if I can trade in my Prius for a zero emissions vehicle. In the end, the answer is no, it’s not currently possible for me to trade in my greenhouse-gas emitting Prius for either a hydrogen car or an EV (electric vehicle). I can’t even get a plug-in Prius hybrid, because those have all been shipped to California. California just passed a measure allowing plug-in Prius hybrids access to the carpool lane, which means the California dealerships quickly swept up all the plug-ins left on the market. So those cars are selling only in California now, for $2,000.00 above the full retail price. I cannot drive from Colorado to California and back to purchase a car. Nor can I afford to spend $80,000.00 to $100,000.00 on a Tesla. Spending money like that on a vehicle is not the sort of reality I have ever lived in. But I tried. There is nothing wrong with my Prius, but for the sake of cutting my greenhouse gas emissions, I tried to get an EV. After my camping trip, I spent hours walking the highway by my house, picking up garbage, 98% of which I was able to recycle. After reading The Sixth Extinction, this was just something I needed to do — just get out there and do something. Now. And then there are other effects, which are like aftershocks that continue to resonate in my head. I can’t walk into a store and think about buying *anything* now without first thinking about the packaging container it comes in — namely, if I can recycle it or not. If I can’t recycle it, I don’t buy it. I wasn’t always this way. A big recycler, yes, I’ve been that way since before high school. Now I’ve just become more extreme. If I could shop at this zero-waste grocery store in Germany, I totally would. This Changes Everything: Capitalism vs. the Climate, by Naomi Klein, published in 2014. This book is so amazing. Unlike The Sixth Extinction, This Changes Everything is full of hope — but it’s a hope that comes with the awareness and urgency of “planet in massive trouble with a dwindling window of time left to save it.” It is that kind of hope. Each one of these books deserves its own blog post, and I’m sorry I’m discussing them altogether like this. All three of these books are vital reads, each inspired by initially reading The Sixth Extinction. After reading The World Is Blue, I joined Dr. Sylvia Earle’s mailing list for Mission Blue. I now read all of her newsletters, follow her on Facebook, and sign every online petition I can to help her create “Hope Spots” — or completely protected areas — in the sea. In the past six years, she has more than doubled the amount of protected marine environment in the ocean — which is still only less than three percent of the total area of the sea. Still, it’s significant. Dr. Sylvia Earle is such an amazing human being, such a mighty real-life goddess, a scientist and conservation warrior — (oh man, here I go with my tears again!) — I’m overwhelmed with awe, gratitude, and amazement that this woman, who was born in 1935, is out there crusading every day to help save planet earth. All of this has had such a huge impact on me — psychologically, emotionally. Facing the reality of what global warming means to our planet in the next few decades has led me into the same mental terrain I occupied when my grandmother died, when my aunts died, when my father died, when my uncle died. Except this is not my personal loss, or a family loss, or a community loss — but a global loss — a huge mass extinction — and it looks like, along with the coral reefs and polar bears and rhinos — human beings might not survive. Civilization as we know it will collapse. Rising oceans will sink many island communities and thriving port cities (like Boston and NYC), leading to the biggest human migration ever. Rising temperatures, droughts, and raging storms will destroy crop output, leading to mass starvation. This is not science fiction. This is science. This is what the data is showing. This future may be coming by the end of the century. Maybe sooner. Some scientists believe the nightmare is much, much closer than most people dare to realize. To face this level of horror is difficult, but it is also necessary. An earth full of catastrophe and death might be the world we’ll be leaving our children. Our grandchildren. Unless we act now. The window of opportunity is closing. And quick. That’s what reading The Sixth Extinction, The World Is Blue, and This Changes Everything is like — these books are full of brilliant, noble people who are sounding the alarm, doing everything they can to create dramatic change, and save the planet — but it still looks like it might be the end of the world. The ozone ‘hole’ of global warming is growing every day, and once we hit the tipping point — which is coming up very soon, we’ll be going down with the planet. Of course, I am a writer — my power of hope is in the stories I pen — and everything I’m feeling right now, my sense of urgency, my crisis, my pain — that is being channeled into my next book. It took me a while to be able to think rationally about climate change, but each day, I get closer to being clear-headed and lucid about the end of the world. I’m also hoping to finish a short story for Glimmer Train before the end of the month. I have an idea about how to channel everything I’ve learned these past few weeks into a (horrifying) piece of literary fiction — I just have to put in the hours of work, to see if I can accomplish the task. To publish in Glimmer Train has been a huge dream of mine for years, and I would *love* to write something good enough to be accepted by that esteemed journal. I would love even more to write something about climate change that was worthy of publication. I walked a lot of miles this week, reading books about global warming. I’m very, very thankful that I did.